I have 3 "accounts". The main account and 2 bypasses. The parental controls for the main house are set to block internet from 7pm until 3pm the next day as my children have kindles and I cannot use a bypass for them. There is a family computer bypass that has no time blocks and has fewer restrictions than the kindles for their homework and research projects. Then there's my bypass account on my personal laptop, as well as my phone and android tablet that has no restrictions. Sometimes my bypass account works, sometimes it doesn't. I never log out of my bypass account on the devices I have bypassed. For some reason, nearly every night, I lose internet access at 9pm despite the fact that not only does my bypass account not have a cut off time nor any restrictions for me, but none of the accounts have a cut off at 9. It just seems to have decided I need to be off the internet at 9pm. It comes back on at random times...sometimes I can use the internet first thing in the morning and other times it will stay off almost all day. I have tried turning off the router, unplugging the router, restarting my devices, and nothing seems to solve this issue. And this doesn't even happen every day or with all devices at once. It's totally random. It also seems to be happening to not just my bypass, but the family computer as well. I tried to work on the other computer today and couldn't, because the family computer bypass was not working either. I can't even go to the parental controls account and turn it all off so I can work because you have to have access to the website, which is blocked, and the the phone app requires me to connect to wifi to use the app rather than just be able to use my data to go to the website. It's like I'm at the mercy of the whims of a menopausal cyborg router. Although you do not logoff from the bypass acccount, start with ensuring with the User Utility that you are really logged in to it. 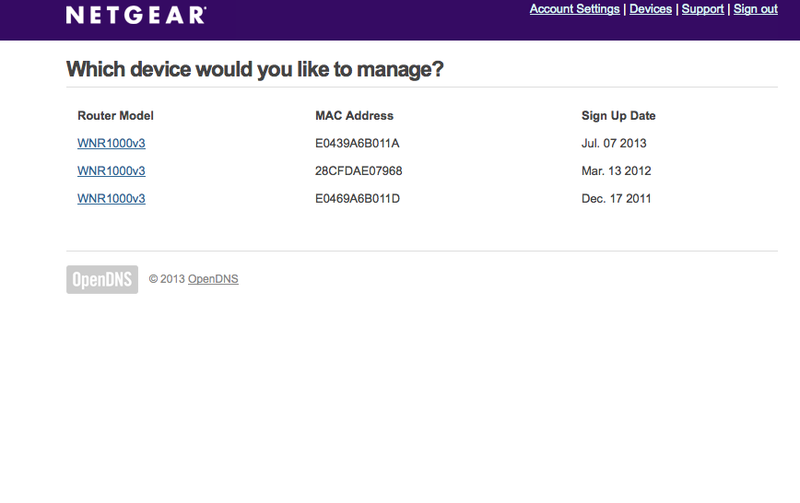 Also visit your dashboard at https://netgear.opendns.com/ to see if there is more than one device registered. Are Management Utility and User Utility the same thing? I'm definitely logged in if it is. I entered the text into the command, but I don't know what any of the text that came up means... And, where do I find devices registered in the dashboard? I've searched every tab and I can't seem to fine anything about devices or what's registered. "Are Management Utility and User Utility the same thing?" No, these are much different programs. The User Utility is just to login to a bypass account. "And, where do I find devices registered in the dashboard?" "I entered the text into the command, but I don't know what any of the text that came up means..."
This is why I thought you could post it here. I've uploaded a screenshot of the command text, and downloaded the user utility. I am for sure logged into my account. I also uploaded a screenshot of my NetGear dashboard. I don't seem to have a "devices" tab like the one in your screenshot. Regarding your command output, you could have copied & pasted the plain text. Whatever, it indicates that you use Netgear LPC and OpenDNS Home in parallel. You must not do this, because these services are incompatible. This is the reason why you think your bypass accounts don't work. Visit the "nomal" OpenDNS dashboard once at https://dashboard.opendns.com/settings/ to delete your network from there. Regarding your LPC dashboard, yes, it seems you're missing the "Devices" tab for whatever reason. Best is to open a support ticket to get this account specific issue resolved. Staff must check your account. Something is wrong with it. Ah, wait. It may well be that the "Devices" tab shows up only if you have more than one device registered. Therefore it turns out that the problem is most likely solely with the fact that you also try to use normal OpenDNS Home. As said, delete the related network from the dashboard, and your bypass accounts and default LPC settings should start to work. I can confirm that you were currently using both the OpenDNS Home Network-based filtering as well as the NETGEAR service. These services will conflict with each other. I have disabled your Home service such that your NETGEAR bypassing account should now work again. Your filtering and bypass filtering should now work correctly. If not, reply and let us know. It seems to be working normal now, thank you both for your help :) I wonder how I managed to end up using 2 filtering services. I'm glad to hear it worked! When you sign up for an account to manage the NETGEAR service, it automatically creates access to the OpenDNS service which is very easy to accidentally configure and it happens all the time. "it happens all the time"
Any chance to get this automatically checked and prevent users from maintaining the OpenDNS Home dashboard if they have a Netgear LPC registered? Do I need to delete my network from OpenDNS to make the netgear parental controls work properly? I am trying to log in to the bypass profile I've created but it's not allowing this. As has been explained above already, you do need to delete your network at https://dashboard.opendns.com/settings/ when using LPC. "I am trying to log in to the bypass profile I've created but it's not allowing this." This could be another, different problem, unrelated to the normal OpenDNS dashboard network. You'll see then after deleting the network. Hi, I'm having the same issue here. Every time when I turn on the netgear parental control, about 10 minutes later, the whole internet will be down. If I restart the router, I can use the internet for around 10 minutes and it will be down again. Even I'm using the bypass account. I have to block my kids internet at night, but I need internet to do my work. Is there any way to fix it, please? I know this is an old thread, but I'm having the same problem as the original poster. I've checked openDNS, and it says I don't have any addresses listed. I've logged out and back in through the netgear program several times, and I still get blocked through my bypass account. I've flushed the DNS cache, and run the nslookup (results below). Any ideas? "flags 422 0 10 19400007E00400014C3"
According to your output, your IP address 69.145.25.136 is registered with OpenDNS network ID 26806678. Open a support ticket, because OpenDNS staff must sort this out for you. Unfortunately im really starting to regret my netgear router purchase. I made a bypass account for my wife and I. However, despite the bypass I'm still restricted. Not sure what else I can do. I said what you can do: open a support ticket. Staff must look into it. We users cannot access your account, of course. Turn off AP Mode. OpenDNS filtering does not work with AP Mode turned on. Go to router administration, select Advanced Tab, then Advanced Setup. Go to Wireless AP, and uncheck Enable AP Mode. The router will reboot and then the Parental Controls will work fine.